Offer songbirds a stylish shelter in your yard with the Home Bazaar Yellow Flower Pot Cottage Bird House. Reminiscent of homes on the eastern seaboard, this detailed unit will certainly bring a dramatic hint to any setting. A side turret and wraparound porch capture the classic theme, while the soft yellow color offers an unexpected bit of fun. Faux windows along the turret and bottom floor further the realistic look, completed with wooden shingles on each roof. Fabric flowers on the trellis, within the window boxes, and in the hanging basket create a cheerful façade, and white trim on the windows, door, and porch rail complete the piece. A 1.25" diameter opening allows birds access to the home, and a white octagon surrounds it for extra visibility. This opening leads to the spacious interior, enabling birds to make a cozy nest. Drainage holes on the base help the nest stay dry, while ventilation gaps under the roof overhang aid in regulating the interior temperature. Screening beneath the entry hole forms a ladder, assisting fledglings in exiting the roost. Remove the back panel to clean the unit and for seasonal nest checks, ensuring the home stays lovely for your feathered friends. The attached hanging tab allows you to place the roost against a wall, post, tree, or fence with ease, while its flat base enables it to rest on any level surface. Crafted from wood and painted yellow, this home will certainly accent your landscaping for several seasons. 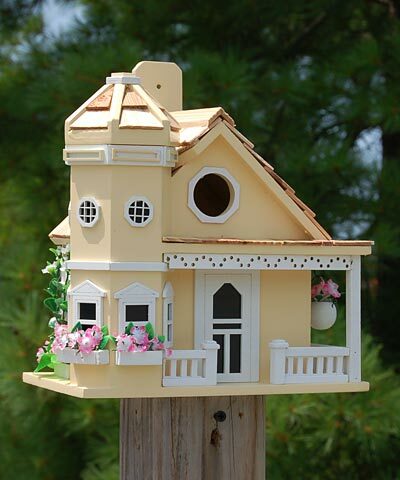 Celebrate classic design in your bird garden with this Yellow Flower Pot Cottage Bird House.